The closest that Rabbi Chaim Leib Hilel came to viniculture as a child was watching his grandfather’s annual efforts to eke out a few bottles in his Montreal basement before Passover. 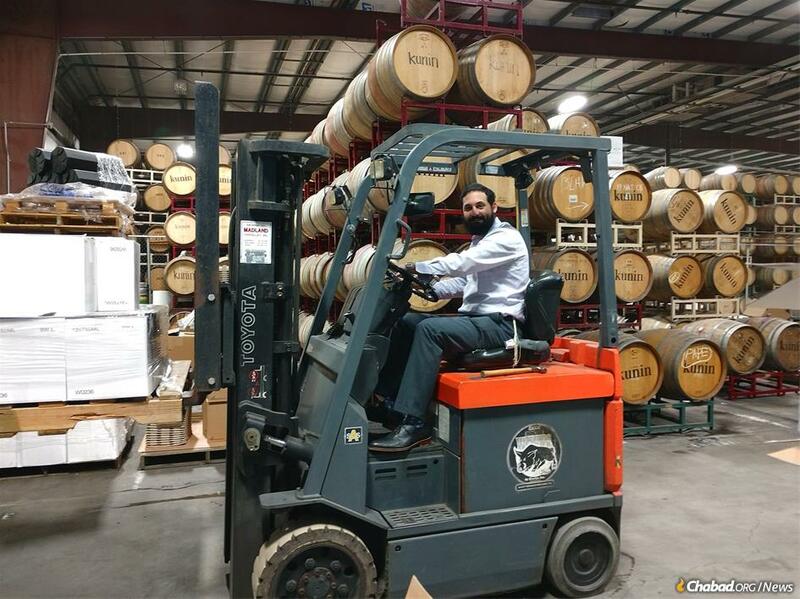 Before moving to California to take up his post as a Chabad on Campus rabbi, winemaking was the last thing Rabbi Chaim Leib Hilel imagined himself doing. The closest he came to viniculture as a child was watching his grandfather’s annual efforts to eke out a few bottles in his Montreal basement before Passover. Hilel got an unexpected introduction to the craft in 2012, three years after he and his wife, Miki, arrived to be co-directors of Chabad of San Luis Obispo and to serve Jewish students at California Polytechnic State University, a campus with 20,000 students. 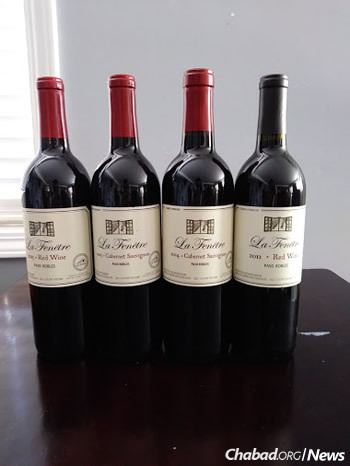 He was contacted by a local winemaker, Josh Klapper, who runs the La Fenêtre (French for “window”) vineyards in nearby Arroyo Grande. Klapper was not yet producing kosher wine, but his father back in New York had asked him to produce some, and Klapper asked the rabbi to supervise the process. After studying the complexities and effort required, the young rabbi declined. But soon after the request, he traveled to New York and ran into a cousin who mentioned that he had recently met a man on Long Island whose son was a winemaker in Hilel’s area, and was looking for a rabbi to help him. He was referring to the Klappers, of course, and not believing in coincidence, Hilel decided to help. The first wine Hilel worked on was a run of kosher merlot. For wine to be considered kosher, the entire wine-making process must be handled or supervised by a Shabbat-observant Jew, from the time the grapes are crushed until the wine is bottled, and all ingredients must be kosher. As the only Shabbat-observant man in town, Hilel was the man for the job, but it left him having to devote more time than expected to the project on an almost daily basis. His responsibilities then and with each new run call for ensuring that the machinery at the winery is kashered (purged from non-kosher residue) before delivery of the grapes from the vineyard. Once the grapes come in, Hilel must mount a forklift, lift the grapes 15 feet into the air and dump them into the machine to begin the fermentation process. The grape mixture is then considered wine, and from this moment until bottling, it must still only be handled by a Shabbat-observant person. For wine to be considered kosher, the entire wine-making process must be handled or supervised by a Shabbat-observant Jew, from the time the grapes are crushed until the beverage is bottled. Twice a day for several weeks, Hilel goes to the winery to punch down the grapes with a metal implement to keep them submerged in liquid. His work continues for months throughout the process: pumping the grapes out to give them oxygen; pressing the grapes; transferring them to kashered barrels; sealing the barrels; topping off the barrels; tasting and adjusting the wine; and finally, the last step, bottling the wine. Once it’s in a sealed bottle, it can be handled by anyone. That first year, they bought a ton of grapes (yes, literally, a ton), which resulted in three barrels, or 75 cases of merlot (900 bottles). The $30 bottles sold for an opening price of $23; within a short time, the run was sold out. People were eager to try the new kosher wine and to lend support to Chabad of San Luis Obispo at the same time. The decision to immerse himself into winemaking, he says, has had far-reaching material and spiritual benefits for himself and others. People have been eager to try the new kosher wine and lend support to Chabad of San Luis Obispo. Hilel has found that his status as a kosher winemaker also has helped him forge relationships with people he otherwise would not have met. He has helped Jewish people who work in the winery to do mitzvahs such as wrapping tefillin, and shaking a lulav and etrog during the Sukkot holiday. Eager to penetrate the academic scene at Cal Poly and reach as many of its estimated 1,000 Jewish students as possible, Hilel never imagined that being a winemaker would open that door for him. But he got an unexpected surprise when a philosophy and religion professor invited him to do a presentation on Judaism, and over coffee afterwards, informed Hilel that he had written a book on wine and religion. Their shared interest led to a wine-tasting session for faculty and the opportunity for the rabbi to teach a class for seniors (over age 21) on kosher wine. 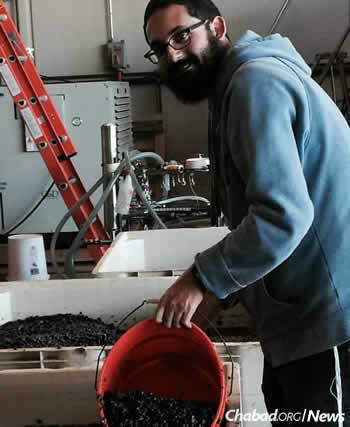 Winemaking also has given Hilel the opportunity to share his trust in G‑d with people in the industry, such as Klapper, famous for his pinot noir wine and very involved in every aspect of its production. Last fall, in the middle of the busy harvest season, all the Jewish holidays fell out on Thursday and Friday, meaning that with Shabbat observance, there were several crucial times in the production process when for three consecutive days, Hilel could not be involved. Klapper was anxious that no one would be touching the wine for so many days. “We are believers,” Hilel told him. “We put our wine in the barrel, say our prayers, and trust in G‑d!” The wine came out excellent, acknowledges Klapper. Hilel with Josh Klapper, who runs the La Fenêtre vineyards in nearby Arroyo Grande. Hilel is not the only Chabad-Lubavitch emissary in California to discover the joys and rewards of making wine, and he enjoys comparing notes with them. Rabbi Elchonon and Chana Tenenbaum up in the Napa Valley have been making wine since 2007. 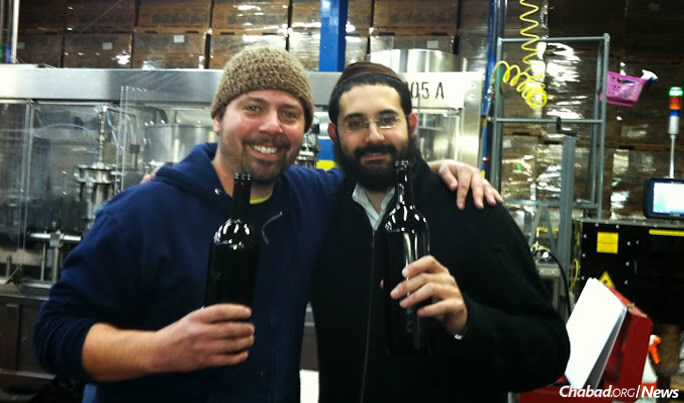 Other Chabad emissaries in California involved in wine production include Rabbis Chaim Zaklos of Solano County; Dov Ber Berkowitz of the Bay Area; and Raleigh Resnick of Alameda County. San Luis Obispo was spared from the recent natural disasters in California, notably the wildfires in nearby Santa Barbara County and in the famed Napa Valley wine country up north. As a result of the fires, many wine tourists who previously gravitated to the Napa Valley are visiting San Luis Obispo wineries as an alternative, providing the wine-making rabbi with more opportunities to share the art of kosher winemaking. With Pesach coming, the Hilels are also busy preparing their Seder. Last year, they hosted 300 guests; this year, with Passover coinciding with spring break, when most students head home, they expect about 50 guests. For the Passover Seder’s traditional four cups of wine, those lucky guests will have a chance to sample fine kosher varietals made in their own neighborhood by their own rabbi. To learn more about the La Fenêtre kosher wines or Jewish life in San Luis Obispo, contact Rabbi Hilel by email here.